I got my Instant Pot a few months ago when Instant Pots went on super sale on Amazon (I’m guessing you heard about the rush of Instant Pot sales like I did). I had never used a pressure cooker before, but I was intrigued after seeing an infomercial while eating out at a restaurant with my friend in Colorado a couple of summers ago. It was one of those infomercials that made an electric pressure cooker look like a magic-worker. They’d throw something in the pot, cook for a few minutes, and pull out perfectly cooked meats and vegetables. I had a hard time believing that what I saw on that infomercial was really possible. But when I saw an Instant Pot on super sale, I decided to give it a try. (PS – I’m linking to the Instant Pot I bought on Amazon, and I highly recommend that you keep an eye on it in case it goes on sale again before the holidays. Or just put it on your holiday wish list for someone to buy for you!). Guess what? It really does work magic with food! After trying it for the first time, I was completely hooked, and I’ve been using my Instant Pot at least weekly (and often more than once a week) since then. I’m now making the best stews and roasts I’ve ever made, and any time I need to make dinner in 30 minutes, I turn to my Instant Pot for something quick and delicious. And that’s where this soup comes in. I had stocked up on ground beef and wanted to make something unique for dinner. I love making soups during the fall and winter, but SOUP is not the first thing I think of when I’m planning on using ground beef. I found a hamburger soup recipe from Pioneer Woman and modified the ingredients as well as the directions to make it Instant Pot-friendly. It was a hit with the whole family, and I was especially happy to have perfectly-cooked vegetables in less than 30 minutes. Turn Instant Pot on SAUTE; add ground beef, onion, and garlic and saute until beef is cooked through. Drain off as much of the oil as possible. Add can of stewed tomatoes with liquid, breaking up the tomatoes into small pieces. Stir in beef broth, diced vegetables, tomato paste, and seasonings. Place lid on the Instant Pot and close the vent (seal). Press the manual button and set the time for 4 minutes. Once the timer beeps, press cancel and turn the valve from seal to vent to release the pressure. Once all of the pressure has released and the silver valve has dropped, remove the lid. This soup can be cooked in a stock pot if you don’t have a pressure cooker. Just allow the soup to simmer until the vegetables are tender. Do you have an Instant Pot? I’d love to hear about your favorite recipes to cook in the Instant Pot in the comments below! © 2016 – 2017, Food Fun Family. All rights reserved. I would say 8-10 servings. It makes a big pot – perfect for leftovers! We are instapot freaks! This recipe looks great! Pinned & Sharing! I can’t wait to try it. Thank you for sharing on Merry Monday! Hope to see ya next week! Surprisingly one of the tastiest soups I have ever had! Thanks for the super easy, tasty, and quick recipe!!! This looks delicious! I am secretly hoping that Santa brings me an Instant pot this year! My kids love beef soup so much. I have tried some recipes but I have a little bit no satisfaction. I’m sure this would work great in the slow cooker as well. I would guess that the standard “low for 6-8 hours” would probably work. How long do I have to let the ground beef cook on l sauté? I’m a beginner to instant pot and I’m trying your recipe as my first recipe to try. Hoping I can get a reply soon. Timer presets it 30. Wasn’t sure if that’s how long it takes or not. Hoping your able to help. I have never timed it. I just cook the ground beef until no pink remains, just like I’d do on the stove top. Hope that helps! Will this work in 6 qt. instantpot ? Yes, it should work just the same! Yes, you’re correct. That was a mistake in the directions. I’m correcting that now. Thank you! Made this tonight! Added an extra cup of broth and a cup of egg noodles! So good! Just wondering how much the Instant Pot was on sale for. Can’t decide whether to pay the $99 or wait fora sale??? I’m pretty sure the very lowest price I’ve seen (like during Black Friday sales) was $79. $99 is a really good price for it. I’m sure if you waited and watched all year, you’d find a slightly lower price, but $99 is definitely a good price point for it! It’s been worth every penny for us! I made this tonight. I used 4 cups of broth and added a can of corn. it came out really hearty and yummy. Even my husband who doesn’t like vegetables said he enjoyed it. perfect for a chilly winter day! Corn would be an amazing addition! So glad even your husband was satisfied! It fed my family of 6 with a little left over. Hope that helps! I have never heard of insta pot but I sure will be doing some checking on Amazon. That soup looks amazing. Where do I get an instant pot? My mom is asking for an inta-pot for Christmas and I had never heard of it before now :) This soup looks tasty! I love INSTANT POT recipes! So fast and easy! This is a great recipe. 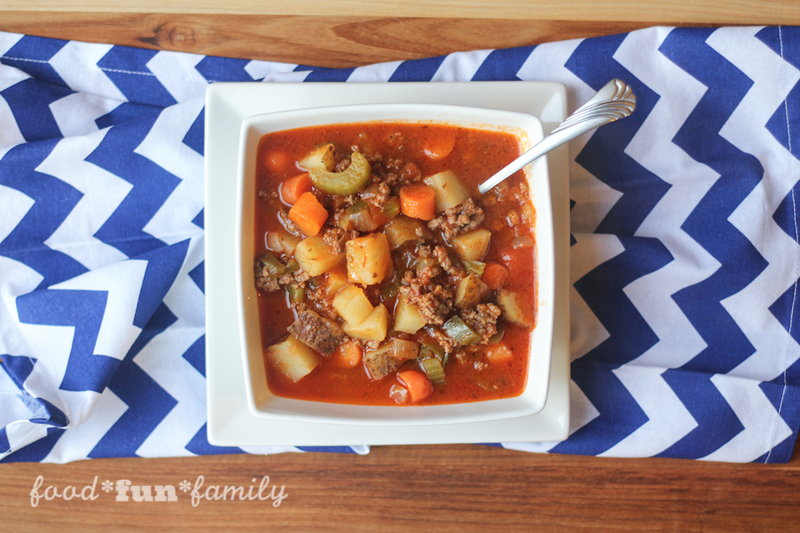 Our family loves soup any time of the year but a hearty beef and vegetable soup is perfect for cool fall days and cold winter months. Love that the recipe is adaptable to pressure cooking, conventional cooking and slow cooking, too. 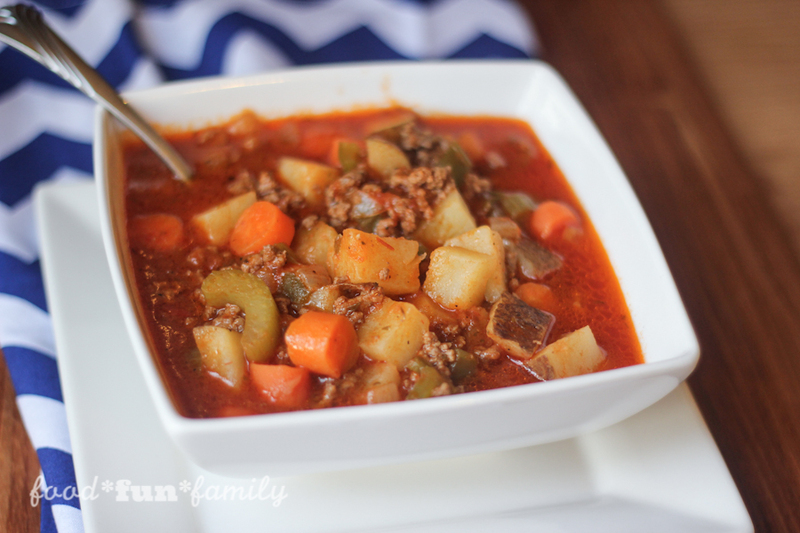 Instant Pot Vegetable Beef Soup looks and sounds delicious and so easy to make. Wow, I’m impressed. I’ve never heard of an Instant Pot so I’m going to check it out. 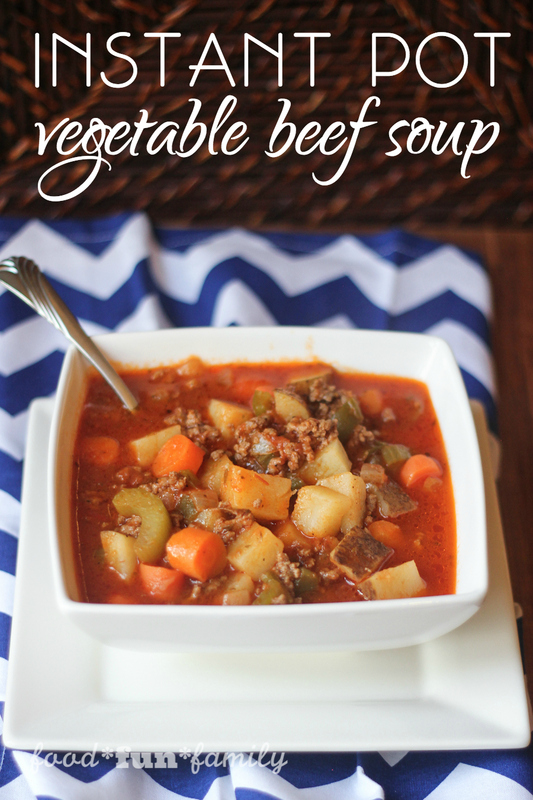 Beef vegetable soup is a classic. I’ve got to try the Instant Pot. I need an Instant Pot. I have heard that they are incredible. 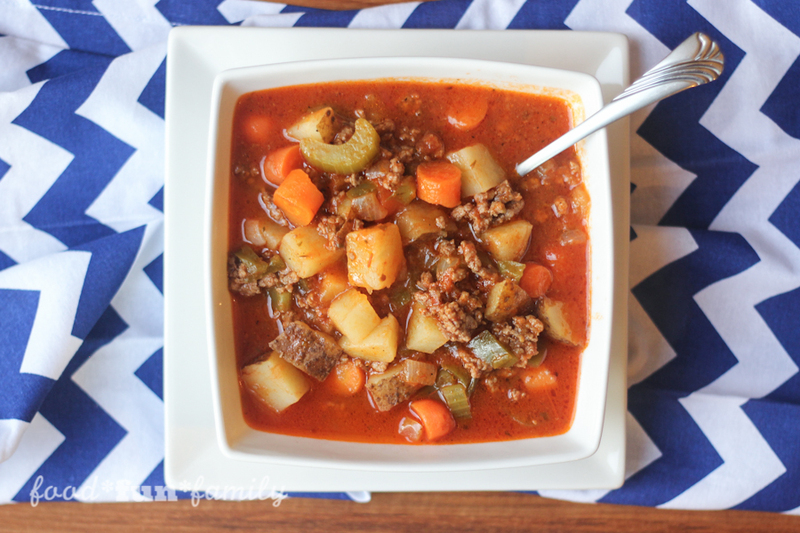 Your Instant Pot Vegetable Beef Soup looks hearty and delicious. I want to make it. I love the ingredients you used! This looks like a delicious soup to eat on a cold day! Thanks! It’s definitely a great soup for cold nights! I love finding new ways to use the same old basic ingredients I’ve always got in my kitchen, you know?